Sands 51 has comfy lounges, fully equipped gourmet kitchen with an alfresco entertaining area overlooking the tennis courts and one of the stunning pool facilities. Located on the first floor, there is internal stair access from a single lock up garage. A spare car parking space outside the garage is provided for your convenience. 51 THE SANDS RESORT is nestled on the one of the most amazing stretches of natural un-spoilt coastline in northern NSW. Yamba boasts incredible weather all year round with the highest average temperatures in the winter months and the perfect lower temperatures in the scorching hot months. The natural sea breezes refresh the senses and invigorates the mind. 51 THE SANDS RESORT offers all the trappings for total relaxation, privacy and comfort. Featuring tennis courts and two pools (including a lap pool) and an amazing large heated spa. Enjoy the multiple alfresco entertaining areas overlooking the in-ground pools. Watch the kids in the pool while you relax at the The Clubhouse while throwing a steak on the one of the three complementary bar-be-ques and enjoying cool refreshing drink. Take a leisurely 100 metre stroll from our unit to the ocean and take in the stunning ocean views along the iconic Pippi Beach to Angourie where you may catch a glimpse of the local pods of dolphins playing in the surf or even a whale or two. Watch the sunrise over the 180 degree ocean panorama and take a walk on the soft white sands in either direction all before breakfast. As the sun is going down, enjoy a glass of bubbly on the balcony and grab your camera to capture one of the spectacular panoramic sunsets over Yamba. 51 THE SANDS RESORT has large sliding doors and picture windows, allowing you to take in the magnificent views of the tennis courts, pool and sub-tropical surrounds. The stylish furnishings have been carefully selected to give you ultimate comfort and the feeling of homely luxury. Recharge your batteries (and your electronic devices) with a charge dock and desk in case you really have to use your laptop (although we hope not). 51 THE SANDS RESORT is perfect for honeymooners or a small family wishing to get away for that unique experience. The accommodation is made up of 1 master bedroom with a queen bed and the second bedroom with 2 single beds. Enjoy a good nights sleep on the 1000 thread count Egyptian cotton sheets and luxury linen in the master bedroom. The second bedroom has hypo allogeneic cotton/linen sheets and covers. There are built in cupboards in both rooms and an ironing board and iron to smooth out any suitcase wrinkles. Fluffy 800gsm Egyptian cotton bath towels are provided, but please bring your own beach towels as they are not included. Leave your car parked at number 51 and walk your stress away. Everything you need is in walking distance under 1km at Yamba Village. Facilities include Coffee shops, Bakeries, Restaurants, Supermarkets, Pharmacy and boutique retail for the latest fashion, footwear and homewares, News agency, Post Office. Food lovers will delighted with the gourmet cafes and restaurants which feature local fresh produce and seafood and best of all the local handmade ice cream or fudge. Whether you love fish and chips or fine dining, Yamba has plenty to offer. Pack your golf clubs and enjoy hit of gold at the Yamba Golf Club and Country Club or just take in the view of the course with breakfast on the Deck Bar and Cafe. Located a leisurely 500m from the unit, you can walk your clubs to the course and enjoy a few rounds at the 19 th hole. If Putt Putt Golf is more your style then enjoy a round at the Bowlo Sports and Leisure complex and keep the kids occupied with 10 pin bowling, indoor rock climbing wall and games area. The Yamba Golf Club and Bowling Club both offer complementary courtesy buses to deliver your right to your doorstep. 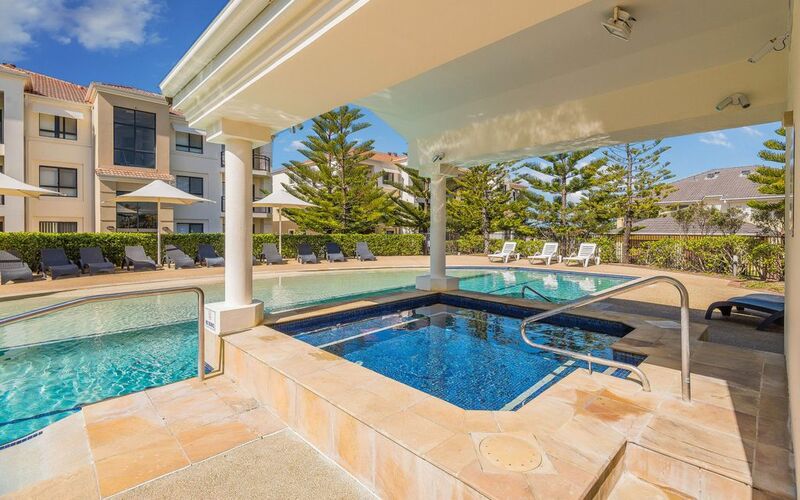 51 THE SANDS RESORT offers the ideal family holiday on the coast. As a gated complex, there are large open areas for the children to run around on and plenty of areas for activities to keep them entertained. We had a lovely time in this clean and tidy well equiped unit. Cant wait to book this same unit again. Love this unit great location the kids had a ball. Very clean and tidy well appointed - We would love to come back for a longer stay. Look forward to seeing you next time in Yamba. This is a great unit in the Sands - We have stayed many times but this is the best so far. Very comfry and well decorated for your comfort. 2 TVs which is great with the kids.